Chicken and pasta combinations are usually easy to fix, and can often be one-pot meals. Plus, many, such as the casseroles, can often be made ahead of time and baked later in the day or the next day. If you don't have leftover cooked chicken, consider using a fully cooked rotisserie chicken, or use the convenient packages of pre-cooked chicken breast strips that can be found in the refrigerated section of the supermarket. A 9-ounce package will yield about 1 1/2 to 2 cups of diced chicken, the perfect amount for many casseroles. A homemade sauce brings this easy chicken noodle casserole together. The casserole includes diced cooked chicken, peas, and Parmesan cheese. Substitute another vegetable for the peas if your family has a favorite. 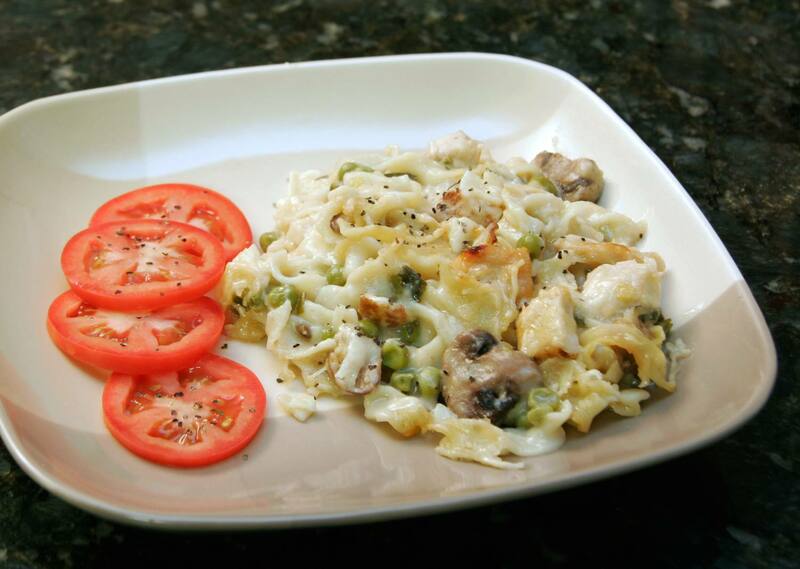 Chicken a la king flavors are featured in this tasty chicken and noodle casserole. This easy chicken casserole recipe was adapted from a vintage community cookbook. Bacon gives this chicken casserole its smoky flavor, and the combination of American and cheddar cheese makes it extra creamy. I used mini penne in the dish, but elbow macaroni or shells would be good as well. This slow cooker chicken dish is a great busy day meal, and it is wonderful over hot cooked pasta or egg noodles. Condensed soups make the dish a snap to prepare. Continue to 5 of 29 below. This is an excellent chicken dish to serve with angel hair pasta or thin spaghetti. The chicken breasts are rolled around basil and mozzarella cheese and served with a homemade cream sauce. Cooked bacon adds smoky flavor to this chicken and pasta salad, along with diced tomatoes, celery, and onion. I used mini penne pasta in this recipe, but macaroni or similar pasta shapes would work as well. Use gemelli pasta, fusilli, or rotini in this chicken pasta casserole. The casserole includes a variety of vegetables and it comes together with an easy cheese sauce. This easy chicken dish is made with purchased Alfredo sauce, zucchini, and fresh tomatoes. Some Cajun seasoning adds flavor to the chicken breasts. Continue to 9 of 29 below. Chicken is cooked in the skillet with mushrooms, peas, tomatoes, and a container of Boursin cheese. Serve the chicken over noodles, linguine, or fettuccine. This chicken Parmesan is super easy to fix and cook in the slow cooker. The chicken is finished in the oven with a topping of mozzarella and Parmesan cheese. This flavorful chicken is a surprisingly tasty combination of tomatoes, lemon juice, tomatoes, and capers. It's great over angel hair pasta, but it would be excellent with linguine or spaghetti as well. Continue to 13 of 29 below. This chicken casserole is made with an easy thickened sauce, spinach, cheddar cheese, and macaroni. In this recipe, chicken breasts are sliced and then cooked with Cajun or Creole seasoning along with bell peppers, onions, and mushrooms. Cooked rotini and Parmesan cheese make this a hearty and tasty skillet meal. Use regular penne or mini penne in this chicken and pasta casserole. The casserole includes vegetables and an easy cheddar cheese sauce. Grill the chicken breasts in a grill pan or on an outdoor grill and then serve it with the flavorful Cajun cream sauce and pasta. Continue to 17 of 29 below. This skillet chicken recipe is easy to prepare, and the combination of vegetables is fabulous. Serve with rotini, fusilli, or a similar pasta for a great-tasting everyday meal. These easy crockpot chicken breasts are cooked with mushrooms and a thick and delicious sauce. The sour cream sauce makes this slow cooker chicken dish stand out. Penne pasta is combined with cubed cooked chicken, mushrooms, and a mozzarella cheese sauce. Canned or frozen artichoke quarters are added to the casserole and then it's baked to perfection. Continue to 21 of 29 below. Chicken spaghetti is one of these Southern comfort foods everyone loves. This is a popular version. This pasta casserole is made with chicken sausage, diced chicken, and cheese. Serve this chicken and pasta bake with a tossed salad and crusty bread for a hearty family meal. Chicken, Mexican cheese, spinach, and two kinds of salsa are layered in this spicy lasagna. This chicken cacciatore is made with boneless chicken breasts and a tasty homemade sauce. Continue to 25 of 29 below. This classic spaghetti and chicken dish is often made with turkey. It can be made with chicken, ham, or tuna as well. Vegetables in this tasty chicken pasta sauce include zucchini, bell pepper, and tomatoes. One reader mentioned that she added eggplant to the dish. The sauce for this chicken and macaroni is made with chicken broth, cream, and smoked gouda cheese. This creamy chicken is fabulous over hot cooked egg noodles. It's made with boneless chicken breasts and a variety of vegetables. Continue to 29 of 29 below. This potluck casserole is made with pasta wheels, chicken, ham, mushrooms, and two kinds of cheese. Serve this dish with a simple green salad or sliced fresh tomatoes and biscuits or rolls.